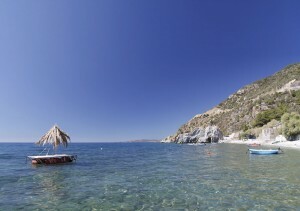 Back from 2 wonderful weeks Touring Lesvos (May 2011). Where do I start? The weather gradually got warmer over the 2 weeks – starting out in low 20s and finishing around 30°c for our last 3 days in Mytilini – pretty hot for hiking! On arrival we were met by Panos from Makis Car Rental with a Jimny Jeep which was to be our wheels for off-roading in our first week, however we ended up keeping it an extra couple of days before exchanging for a nippy little Suzuki Wagon. Both great cars – economical to hire and fuel and in excellent mechanical condition. Great personal and friendly service from Panos (who is the son of Makis who owns both the rental company and the Mirsini Hotel). When we found a nail in one of the car tyres they got a friend to open his repair centre on a Sunday and it was fixed within the hour! 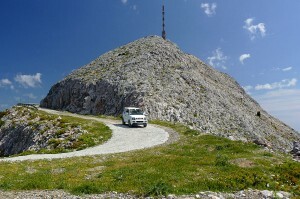 The jeep allowed us to explore some interesting and remote villages and off road trails. We stayed 5 nights in Molyvos at Sunflower Studios on the back road to Eftalou – where Toula made us feel one of the family (especially when she left eggs from her chickens in our kitchen). Then we moved on to Plomari and a great hotel in Ag. Isodoros – the Mirsini which became home for 6 nights. This is our favouritee part of the island with so much to see and do. 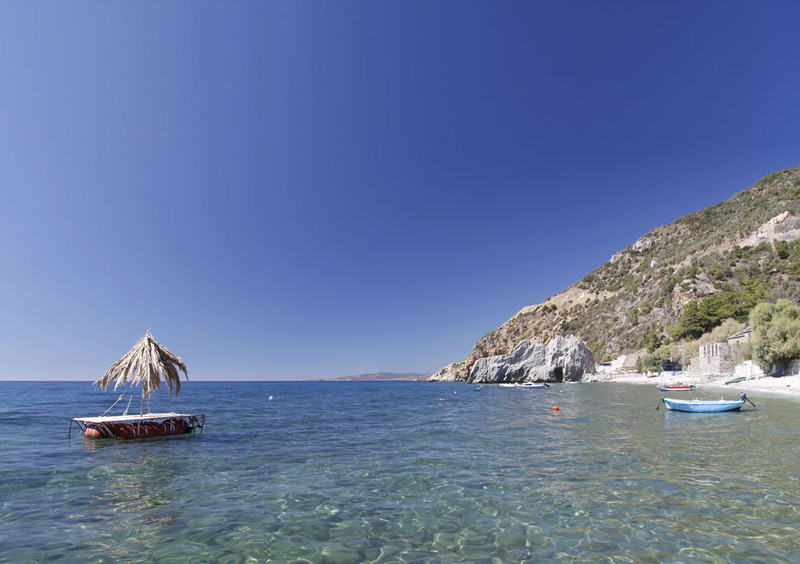 We never met any other native English speakers in this area – truly authentic Greek ambience! Our final 3 nights saw us staying at Akleidi Hotel, just south of Mytilene . This is very handy for the airport, city sights, the west coast of Gera and the beautiful east coast north of the city. All our rooms were spotless, with good beds, ample storage and well-equipped kitchens (although we only ever made coffee and boiled those eggs!). Room prices had not increased since our last visit in 2008. We ate at a good number of always excellent tavernas – some old favourites and some new. In Molyvos we had great food at “To Xani” and “Alonia” and a gyros lunch from “Friends”. We visited our old friends in Petra at “Thalassa” (formerly they ran “To Petri”) and could not resist three evening visits as the food was as good as ever and Maria and her family were so pleased to see us again. In Ag. Isodoros we revisited “Taverna Tou Panaii” and tried out two new places. “Mouria” is adjacent to Mirsini Hotel and serves yummy everything in massive portions at miniscule prices; in Plomari we had two evenings at “Mama Katerina’s”, the first of which meant we helped owner Eleni to celebrate her name day. The food here is again delicious. As it was at another old favourite just along the coast where Penelope at “Melinda” makes the best stuffed courgette flowers in the world. Our cheapest meal was a mezes lunch (ouzo, olives, cheese, tomato, cucumber) for the amazing price of €3 for the two of us in Megalochori. 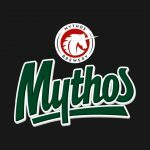 And in Anemotia we had a gigantic Greek salad and 2 Mythos for a total of €8. The price of eating out on Lesvos seems hardly to have changed! The most we paid for a meal of 2 starters, 2 mains, bread, wine and ouzo was €27. Usually it was around €21 – €24. The best tyropittes on the island in my book now are from Mandamados – even better than those from Perama, which take some beating! Other “eatings” included lunch at the little rustic taverna between Eftalou and Skala Sykaminias, coffee and spoonfruits at the delightfully ramshackle Ag. Dimitrios, beer and fruit in Loutroupli Thermi in the wisteria shaded street, lunch in the plateia of Plomari at “H Γωνια”, Greek salad and garides on the waterfront at Koundouroudia and a relaxed and delicious 3 hour lunch at “Akroyali” on Panagiouda harbour with some friends from Florida who by coincidence were on the island at the same time as us! We are not beach babes – we walk, we drive, we explore. Despite this being our sixth visit to the island we found many new places and sadly just could not get around to many old favourites . . . . too much Greece, too little time! 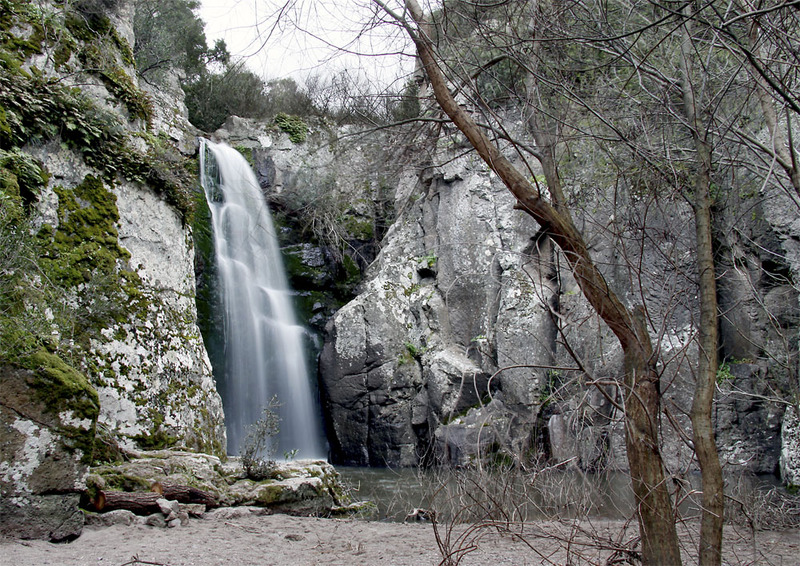 Thanks to Robin and Carol of Lesvos Calendars we found remote Man’Katsa Waterfalls. Nearby we eventually found an old stone arched bridge and on the same day we visited 12th century Ag. Stephanos church and the tombs on the coast at Palios. All new to us. Everywhere was awash with the most beautiful wild flowers, as the cold wet spring had delayed Mother Nature a little. 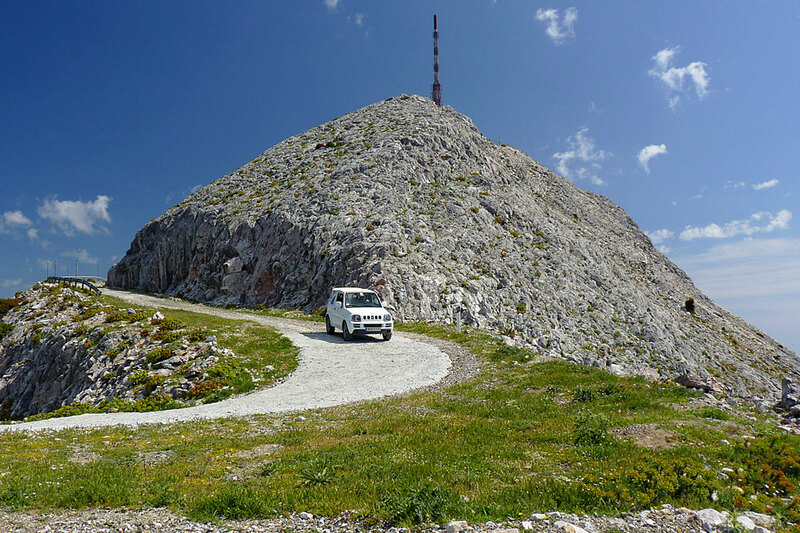 Our jeep was great for off-roading, so we revisited Kremasti Bridge and nearby Klopedi Monastery and Temple. Near the bridge is the tiny church of Ag. Therapontas. We just happened to be there on the name day and were invited by the priest and ladies of nearby Pelopi to join in the festivities. A riotious occasion of dancing, singing, eating yummy cakes, drinking good wine and we were presented with a huge loaf of bread (which I had to give most of to Toula as it would never have kept long enough for us to eat!). Other sites that day were the tiny church in the rock near Ag. Paraskevi and the Halinados Christian Basilica. On another day we did the jeep trail to Klapados (a ruined village which is the site of the last victorious battle against the Turks for the liberation of Lesvos in 1912). We revisited the hidden Panagia Kryfti and hot spring along the dirt road west of Melinda and the jeep also took us to the very pinnacle of Mt Olympus, the second highest point on the island after Lepetymnos, with it’s amazing views (there is a tarmac road almost to the top so easily done in an ordinary car), around the forest trails north of Plomari to remote villages and to Kastellos (the prominent hill top site of a mediaeval kastro). Many of the dirt roads on the island can be done in a normal car, but great care is needed so would recommend a jeep if you have a spirit of adventure. With it’s network of forest trails, dirt roads, footpaths, ancient cobbled roads and paved kalderimi Lesvos is a walkers paradise. At this time of year the bonus is the flowers and of course the fragrance of herbs. We walked the Valley of the Mills between Petra and Petri, with it’s interesting industrial relics and great views. A lovely 8 mile circuit from Anemotia allowed us to see and smell the rare and beautiful Rhodeodendron Luteum (beautiful yellow flowers) – this is the only place in Europe where it grows naturally. Sadly the nearby monastery was closed – we had no luck with such places at all! Even the Folk Museum at Ambeliko was not open as the preist who administers the keys was away on business elsewhere on the island. Also closed was the Theophilos Museum at Vareia. We are meant to return of course! Our longest walk (all day) took us to the eco farm at Toumba where Kostas Mouras is living the eco-warrior life and providing accomodation, horse-riding and footpath clearing activity for like-minded souls. He served us cold beers and we had a long and interesting conversation with glorious views from his hill top property. The footpaths do need some clearing as we found many are difficult to find, even with instructions. Signs are becoming more prevalent and there are indications that locals are starting to see the attractiveness of Lesvos to eco travellers. Walkers, birdwatchers, wildlife and flower enthusiasts can all bring in extra income to the island and promote these valuable attractions to wider audiences. Another walk took us on a 5 mile circuit around the little promontory north of Loutra, with glorious views over the Gulf of Gera. We reached here by ferry from Perama, which gave us the excuse for the excellent lunch at Koundouroudia (another old favourite). We later drove the entire coastal road of the Gulf, with it’s highlights of Ag. Therapon church which sits on the beach, Skala Loutron, the windmill at Perama, the headland beyond Katsinia, Gera Spa and the beautiful cove at Ag. Ermighenis. Based in Mytilini we made a tour of the Kastro – excellent value at €2 entry – and like most places on the island we had it all to ourselves! Where was everyone? The city itself was workaday busy and for a short time we enjoyed the atmosphere as we explored the waterfront, northern harbour, faded mansion houses, convoluted backstreets and the church of Ag. Therapon and the magnificent Cathedral. Also from here we visited Thermi, to both see the faded glory of Sarlitza Palace Spa Hotel, the nearby medieval bathhouse and to enjoy a 4 mile circular walk which took us 6 hours! This was due to the abundance of interest along the way – ancient churches, open-air churches, tradition tower houses, interesting hamlets, Turkish fountains, and best of all the Archaeological site at Thermi, just south of the Votsala Hotel. Here is a Bronze Age village site, first discovered in 1932, covered over and re-excavated in 2005. The lady in the office gladly showed us round and with her limited English and my awful Greek we got a good picture of it all. There was video in English and also a book which she generously gifted to us. The site is beautifully laid out with visitor paths lined with flowering shrubs and herbs which take you along those ancient street between large houses which have evidence of beds, benches, cooking hearths and a well preserved kiln. Plus several graves of children with their stone slab roof still in place. We hardly saw any other tourists – certainly not during our daytime adventures – but we met many local people who would give us small gifts – herbs, eggs, bread, wine, cakes, ouzo, walnuts, bread, a traditional oil and flower healing ointment, even a job offer! If I would help YiaYia in the taverna kitchen Pappou would teach me Greek! We were invited into a garden of a tiny cottage in a remote coastal corner by an elderly lady and given beer and hospitality and we learned that she was a retiree from the Greek administrative machine. Now she paints, writes, potters and cares for her family of 5 dogs. By Christine on 8th August 2012. 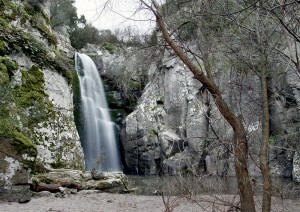 This entry was posted in Activities and tagged activities, Lesvos by Christine. Bookmark the permalink. I first visited Lesvos in 2001 - only my second trip to Greece - and I knew I had found the perfect island. I enjoy walking and exploring - even after seven visits there are many places still to be discovered. Having at first arrived via the package route (but always done our own thing!) my partner and I now travel independently, hire a 4WD & stay in 3 or 4 locations around the island during a stay. This allows more variety in places to see, places to eat and a different view in the mornings. Apart from the scenery and the food what I really love are the people. We have met so many interesting people on our travels and they always welcome us back like old friends. Our last visit was in 2013 and our next is already on the drawing board.